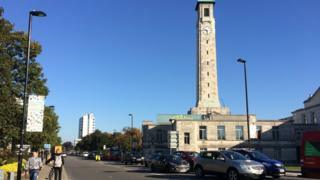 Funding of £1.8m has been secured from the government to help improve air quality in Southampton. The cash from Defra will fund a range of measures put forward by the city council in January. Under the plans taxis and buses will have to meet low emission regulations. The authority said proposals for ships docked in the city port to run on electricity, instead of leaving their engines running, "were unfortunately not supported". It said it would continue to work with the port to "make this happen". Taxi firms are also being offered a free trial to switch to electric vehicles with further charging points also being put in. Other measures include a freight consolidation service - where several small shipments, all going to the same location, are bundled and shipped together to reduce the number of journeys made by HGVs. A four-and-a-half mile (7km) stretch of the A3024 is also being upgraded to encourage cycling and walking. The road will be widened to help buses run more reliably and efficiently. A bus that can filter pollution from the air is also being tested in the city. Southampton is one of four English cities preparing to introduce clean air zones by next year. The others are Birmingham, Derby and Leeds.